Bring back the slice – especially one with a rich shortcrust base topped with a tangy lemon curd that's like eating sunshine. Serve as is, or with sour cream or yoghurt. 1. Line a 20cm x 30cm baking tin with baking paper, leaving overhang to help with removal from the tin. 2. To make the base, whiz the flour, butter, sugar and sea salt in a food processor until it looks like sand. Add chilled water by the spoonful, pulsing, until it starts coming together. Form into a ball, knead lightly and rest, covered, in the fridge for 20 minutes. 3. Heat the oven to 180C. Press the dough over the base of the pan, right to the edges. Bake for 20 to 25 minutes until firm to the touch. 4. While the base is baking, whiz the eggs, flour, sugar, lemon zest and lemon juice until smooth in the same food processor bowl you used for the base (no need to wash it out again) and set aside for 10 minutes. Remove the base from the oven, re-whisk the topping, and gently pour over the base. 5. Reduce the oven temperature to 170C and bake for 15 minutes or until just set. Cool completely in the tray, then lift out and refrigerate overnight. 6. 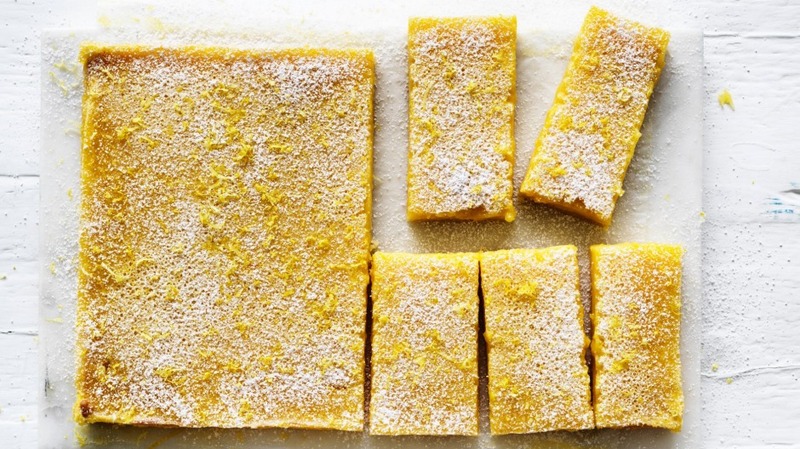 Dust with icing sugar, strew with lemon zest, and cut into bars.